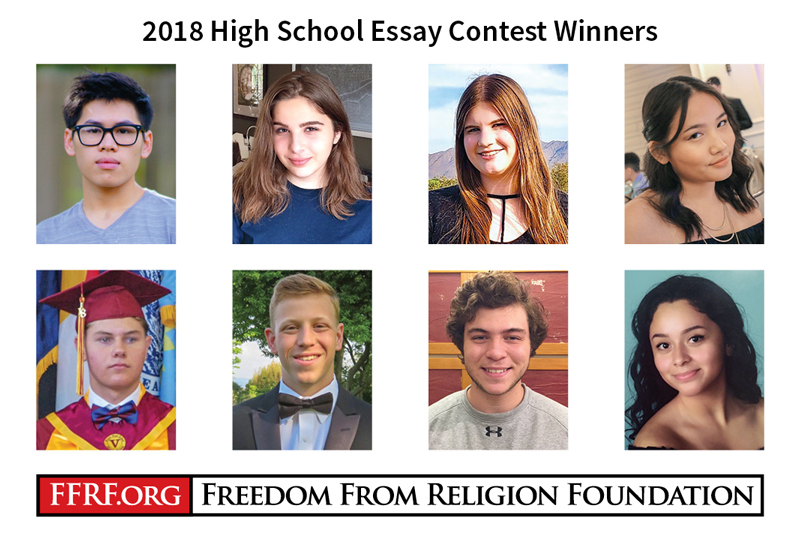 The Freedom From Religion Foundation is proud to announce the 24 winners — including 10 major prizes — of the 2018 William Schulz High School Essay Contest for college-bound seniors. FFRF has offered essay competitions to college students since 1979, high school students since 1994 and graduate students since 2010. High school seniors were asked to write a personal persuasive essay on the topic of “Why I believe ‘They who live on love and laughter /Don’t mess around with the hereafter,” a rhyme by the legendary lyricist Yip Harburg. After carefully reviewing more than 260 essays, FFRF awarded 10 top prizes and 14 honorable mentions. Winners are listed below with their age, the college or university they will be attending, and the award amount. FFRF has paid out a total of $13,000 in award money for this contest this year. Gaylor adds that there were so many exceptional essays it was hard not to award them all. The high school contest is named for the late William J. Schulz, a Wisconsin member who died at 57. He was a mechanical engineer and cared deeply about FFRF’s work, leaving a bequest that funds the award. FFRF also thanks Dean and Dorea Schramm of Florida for providing a $100 bonus to students who are members of a secular student club or the Secular Student Alliance. The total of $13,000 reflects those bonuses. The Freedom From Religion Foundation is a national nonprofit with more than 32,000 members across the country dedicated to protecting the constitutional principle of separation between state and church, and educating the public on matters relating to nontheism.